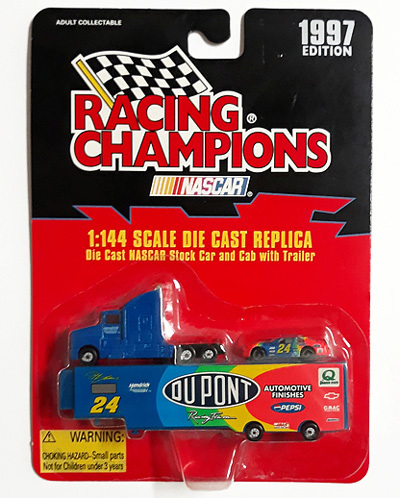 1997 Jeff Gordon #24 Dupont - Mini Transporter w/Car NASCAR 1/144 diecast, by Racing Champions. The Hendrick Motorsports #24 Dupont Team Transporter features a diecast Cab with Trailer and a Jeff Gordon #24 Dupont car. 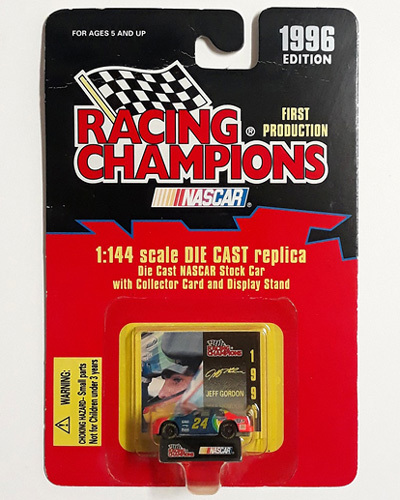 Packaging measures 5 1/2" x 7 1/2"
1996 Jeff Gordon #24 Dupont / Mini Chevrolet Monte Carlo NASCAR 1/144 diecast, by Racing Champions. The Hendrick Motorsports #24 Dupont was raced by Jeff Gordon during the 1996 Winston Cup season. Includes a Collector Card and Display Stand. 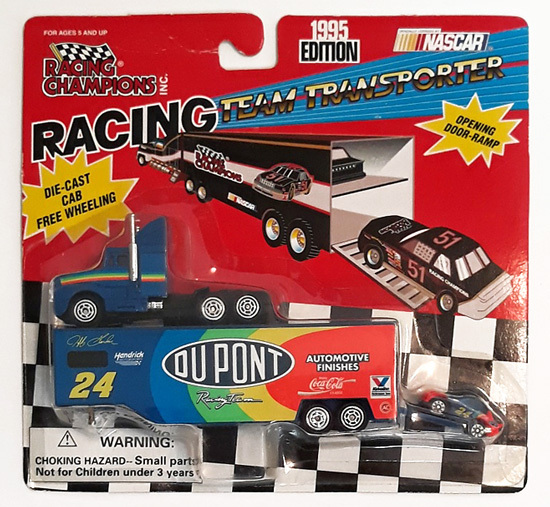 Packaging measures 4 1/4" x 6 1/2"
1995 Jeff Gordon #24 Dupont - Transporter w/Car NASCAR 1/144+ diecast, by Racing Champions. The Hendrick Motorsports #24 Dupont Team Transporter features a diecast Cab with Trailer, opening rear door ramp and a Jeff Gordon #24 Dupont car. Packaging measures 7 5/8" x 7 1/4"
This is an odd sized piece, because the Hauler is about 2x larger than an actual 1:144 scale, but the car is only slightly larger than 1:144. 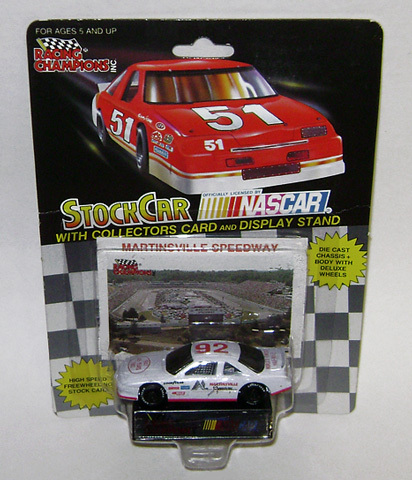 No scale is listed on the packaging, but Beckett Racing Price Guide shows the scale as 1:144, which it is not. 1992 Jeff Gordon #1 Baby Ruth / Ford Thunderbird NASCAR diecast, by Action. 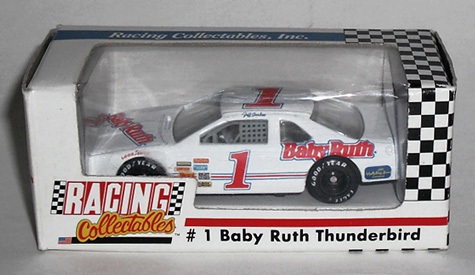 The Bill Davis Racing #1 Baby Ruth Ford Thunderbird was raced by Jeff Gordon during the 1992 NASCAR Busch Series season.